In my attempts to raise money for the Relay for Life that I am participating in this June, I asked a friend for some help. The friend happens to be my local tattoo artist. Together, we are raffling off a $75 gift certificate to the tattoo shop he works for and all the proceeds from the raffle sales will be donated for Relay for Life. 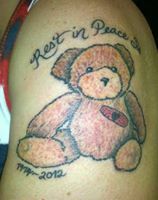 The tattoo artist who I am working with, actually did the memorial tattoo for my sister; the “All Will Get Better Bear”. I love the idea and it seems to be going well. We’ve had several people express interest and we have about 4 months of sales to collect. My actually fundraising goal is $100.00. I’m already half-way there, before starting this little venture. I am hoping to sell enough tickets to reach $500.00. I know it’s a considerable amount, but it would mean so much to me to be able to turn in that amount in donations. I do have a fundraising page, which people can also donate directly to. It makes no difference to me as it all goes to the American Cancer Society. If you have spare change or would like to donate, check out http://www.relayforlife.org, Every bit helps to end the disease, far too many of us are familiar with: Cancer.